Master of the "Indirect Exchange"
JAPANESE MONITIZATION - The frontrunner of outright monetization. Will fiscal policy dominate monetary policy? However, overcoming deflation is probably not the only challenge Mr. Kuroda will face. Another major issue for the new governor will be a threat of fiscal dominance. In a 1981 article entitled Some Unpleasant Monetarist Arithmetic for the Federal Reserve Bank of Minneapolis quarterly review, Thomas Sargent and Neil Wallace wrote that in an economy that satisfies monetarist assumptions (in which the monetary base supplied by the central bank determines prices – the quantity theory of money), price stability can be achieved if the central bank remains independent. But they argued that prices would be determined by the government’s fiscal stance if monetary policy were dominated by fiscal policy, wherein the monetary base was used for the government’s debt repayments, amid the prospect that future tax receipts could not retire the debt. This view has evolved into the fiscal theory of the price level. In Japan, amid growing doubts about fiscal sustainability, not only have the government and BoJ jointly set a target for price stability, but political calls for the BoJ to conduct de facto monetisation have become mainstream. While monetisation can be effective in ending deflation, history shows there is a risk that it could destroy fiscal discipline. Whether this loss of fiscal discipline will actually lead to accelerating of inflation in the foreseeable future is a moot point. However, as the predicament in peripheral Europe has shown, bond yields can soar once the markets start to worry seriously about fiscal collapse (though Japan’s having its own currency reduces default risk). In Japan, a sharp drop in JGB prices could significantly destabilise the financial sector, as most government bonds are held by domestic banks. The BoJ will inevitably become more entwined in the government’s debt management as it aggressively expands its JGB buying with the aim of defeating deflation. As a result, the BoJ may find itself needing to prioritise the stability of the government bond market (and the financial system) over price stability. In other words, even if warranted for price stability, rate hikes and the sale of JGB holdings could be held back. In order to avoid this, it is vital that aggressive monetary easing be undertaken together with a credible fiscal restructuring plan. The Shirakawa-led BoJ steadfastly held its JGB purchases to those with maturities of less than three years, as it thought this would dispel suspicions of monetisation (but maybe avoiding monetisation and avoiding deflation are antithetic). Under that policy, the retirement of maturing bonds would shrink the BoJ’s JGB holdings to a normal level in three years, without a having to engage in any selling operations. The new Kuroda-led BoJ is bent on buying longer-dated JGBs. This could intensify the dilemma of having to choose between price stability or financial-system stability when inflation actually starts to pick up. Moreover, at that juncture, fiscal policy may be calling the tune and the BoJ may be obliged to respond as conditions warrant. BoJ too late to the inflation-setting party? It is ironic that the BoJ was forced to adopt an inflation targeting regime at a time when other central banks are re-examining its usefulness. Until the global financial crisis, monetary policy in most advanced countries was centred on price stability, as it was felt that that would create the foundation for stable and sustainable economic growth. But now, with the responsibility for preserving financial-system stability, the role of central banks as lender of last resort, market maker of last resort and guardian of fiscal stability has grown in importance. Central banks are now having to reconsider their objectives and priorities. It is in this setting that the usefulness of inflation targeting is being questioned, with Harvard’s Jeffrey Frankel going so far as to write its obituary last May (The Death of Inflation Targeting). Democratic governments in low-growth economies sometimes rely on their central banks to support fiscal policy so as to avoid asking voters to share more of the burden. It is the pathology of modern democracies to foist our bills onto future generations and one could argue that the prolongation of our zero-rate regimes and quantitative easing are facilitating this. When this societal weakness is combined with today’s financialised economies, we get a pronounced inclination toward monetisation, which could lead to very serious problems. While Governor Shirakawa has described the BoJ as the “frontrunner” in venturing into unknown territory with policies like zero rates and quantitative easing, Japan could also become the frontrunner of outright monetisation. It seems more likely to Morgan Stanley's Gerard Minack that central bankers may win the battle: sustaining recovery in developed economies with extraordinarily loose monetary policy. For a while this would go hand-in-hand with better equity performance. The battle is against a crisis caused by too loose monetary policy, elevated debt and mis-priced risk. Ironically, he notes, central bankers may overcome these problems by running even looser monetary policy, encouraging a new round of levering up, and fresh mis-pricing of risk. However, winning the battle isn't winning the war. If central bankers do win this round, the next downturn could be, in Minack's view, an omnishambles. It has not been clear to me that central bankers could single-handedly sustain recovery. Fiscal stimulus helped recovery, but its withdrawal contributed to renewed recession in Europe and the UK. Markets now assume that fiscal tightening in the US will not end the same way that it did elsewhere. My economic colleagues also see better times ahead. In short, it may be that extraordinarily loose money policy will work. First, monetary policy will have succeeded, in part, by driving interest rates to all-time lows. It is not just policy rates at extreme lows: more importantly, the average effective rate paid on debt is exceptionally low. Exhibit 1 shows the average effective interest paid on the entire stock of (public and private) debt in the US. Second, one measure of policy ‘success’ seems to be rising leverage. It is important to have a functioning credit system. But it’s not clear to me that it’s a good thing to have leverage rise. That is now happening in the US: aggregate non-financial debt/GDP increased in the December quarter, the first rise in four years. The US had been an exception for having seen any decline in leverage in this cycle. Aggregate (non-financial) leverage in the major developed economies is already at all-time highs (Exhibit 2). Third, there are growing signs that risk is (again) being mis-priced. For example, high yield credit yields are now at all-time lows (Exhibit 3). If the central banks win the battle I suspect the mis-pricing of risk will become more widespread. In short, it seems more likely that central bankers may add another leg to the credit super-cycle. The super-cycle was 30 years where total leverage ratcheted higher and interest rates ratcheted lower. There were shorter cycles in interest rates, but it was a sequence of lower lows and lower highs through the past 30 years. Exhibit 4 shows US Federal funds target rate. The trend decline in policy rates led to a trend decline in sovereign borrowing costs (Exhibit 5 shows G7 long-end yields in real and nominal terms). The decline in risk-free rates has over time reduced the effective rate paid by other borrowers. Hence the decline in the average effective interest rate paid by all borrowers, shown in Exhibit 1 (which is for US debt). The super-cycle will end when policy-makers exhaust their ability to provide cash-flow relief to under-pressure borrowers, ending the trend to rising leverage. I had thought that the crisis of 2008-09 would do this. I now think I may have been wrong. An important test in my view is that ability of the US to cope with fiscal tightening. If low rates and rising leverage offset fiscal tightening, then it seems a new credit leg will have started. The downside is that in the next downturn – whenever it comes – central banks will find it even more difficult to provide cash-flow relief to borrowers. Borrowers, at that stage, will likely be even more leveraged than now (or in 2008 – financials probably will be exceptions) but paying an effective average interest rate significantly below the average in 2008. The key question for investors in this scenario is when (and how) this cycle may end. In many respects, this would be a repeat of the TMT bubble aftermath. The question would be whether we are now 2003, with 3-4 good years to go, or 2006, with the cycle end not imminent but not that far over the horizon. I’m not sure: history tends to rhyme, not repeat (Exhibit 6). My hunch, however, is that this cycle is already closer to 2006 than 2003. I’ll explain in another note what I’m looking to as warning that another 2008 is possible. Beneath the positive headlines Bloomberg's Joe Brusuelas notes that there is evidence that a good portion of consumers continue to face a difficult adjustment to the $125 billion tax hike in January and the 15 percent increase in gasoline prices during the past four months. Spending among the upper quintile of income earners is masking weakness elsewhere but it is jobs headlines that are really hiding the dismal reality in America. As the following chart shows, confirming our earlier discussion, the middle-class income-earner is becoming an endangered species (with no 'conservation group' willing to stand up for them) as the government holds the lowest income earners' hand and Bernanke the highest. Over the weekend, FT noted that China’s central bank reported that companies and individuals sold RMB 684 billion ($109 billion) worth of foreign exchange and bought an equivalent amount of Chinese currency in January, a record for a single month. On the chart below, please point out the Chinese "hot-money" inflationary ticking time bomb (hint: highlighted). Why "time bomb"? For the answer, we go to the simplest definition of inflation, which is as follows: "when too much money chases too few goods and services." In January, the money in domestic circulation via FX conduits just soared by a record amount, without a comparable increase in goods and services. All else equal, this is called the "hot money" effect, and manifests itself in a surge in Chinese inflation usually with a 3 month lag to whenever the Chairsatan starts experiment with the US monetary base. January just happens to be about three months after Bernanke announced QEternity. It also explains why China has been doing everything in its power in the past several weeks to reduce excess liquidity in its economy, and to telegraph that suddenly its economy is once again slowing down drastically, while inflation is ramping up. Take home: China has had enough with the global, and certainly Japanese, reflation efforts as further proven by last week's repeated warnings by the entire Chinese political elite against currency wars. How much longer will the "developed world" be able to push Chinese inflation before, like in 2011, it all just snaps? In recent years, multinational U.S.-based corporations have systematically accumulated staggering amounts of profits offshore. Much if not most of these profits were actually earned in the United States but have been artificially shifted to foreign tax havens to avoid U.S. corporate income taxes. Ten particularly aggressive companies report that their offshore profit holdings have grown by more than $5 billion each in just the past year. Apple Inc. reports adding $28 billion in offshore cash in the past year, while Microsoft’s offshore stash increased by $16 billion.1 Other Fortune 500 companies adding at least $5 billion offshore in the past year include Pfizer, Merck, Google,2 Abbott Laboratories, Johnson & Johnson, Citigroup, IBM, and General Electric. 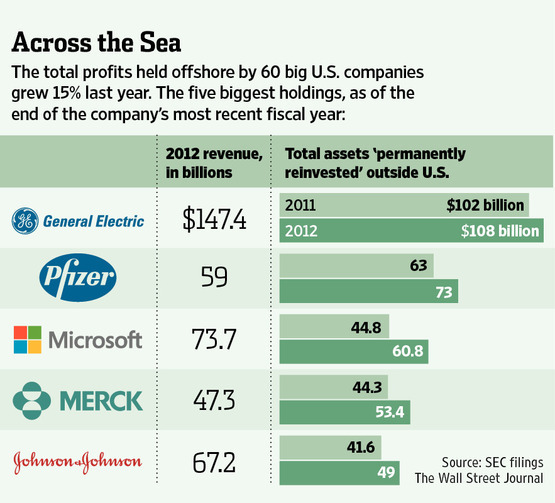 These ten companies increased their offshore profit holdings by a total of $107 billion in just the past year. But lobbyists for the multinationals are urging Congress to go even further, by permanently exempting from U.S. corporate income taxes all profits that U.S. corporations manage to have treated as “foreign.” Such a change would make it even more profitable for multinational corporations to shift jobs and profits out of the United States, and could cost the U.S. government hundreds of billions of dollars in additional lost revenues. 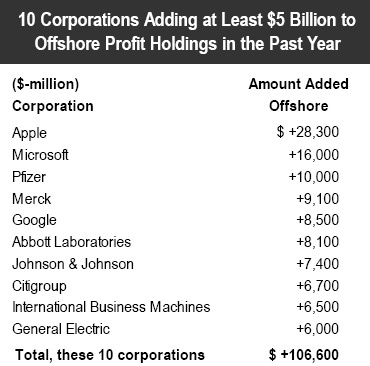 Showing that 2012 is not an exception, over the past four years, 48 corporations each added at least $3 billion to their offshore profit hoards. The total that these 48 companies added over four years was $518 billion. Michigan Senator Carl Levin recently observed that such practices may be legal, but they shouldn’t be; ending the practice of deferral would render artificial profit shifting illegal and would restore significant revenues to the U.S. Treasury. 2 Google, Starbucks, and Amazon were recently called before a U.K. Parliament committee to answer charges that they were dodging U.K. taxes by artificially shifting profits to tax haven countries. See Rajeev Syal and Patrick Wintour, “MPs attack Amazon, Google and Starbucks over tax avoidance,” The Guardian, December 2, 2012 available at http://www.guardian.co.uk/business/2012/dec/03/amazon-google-starbucks-tax-avoidance. 4 Hewlett-Packard was also the target of a recent Senate Permanent Subcommittee on Investigations probe. See http://www.hsgac.senate.gov/subcommittees/investigations/media/subcommittee-hearing-to-examine_billions-ofdollars-in-us-tax-avoidance-by-multinational-corporations-. Despite the hopes and greed of the marginal greater fool algo lifting equity markets to highs, Goldman's business cycle 'swirlogram' has dropped notably into the 'Slowdown' phase after a brief 6-month trip into 'Expansion'. China growth risks remain the largest weight on investors' angst (Chinese IP growth and retail sales for the January/February period were sequentially weaker, and overall disappointing) as Euro and US risks have 'apparently' fallen in the last week or two. Merrill Lynch’s Mary Anne Bartels observes that market Breadth and Volume are confirming new S&P 500 recovery highs. “Market breadth is strong and the stocks only advance-decline lines continue to confirm new recovery highs for the S&P 500. A major complaint about last week’s breakout is the lack of volume confirmation. 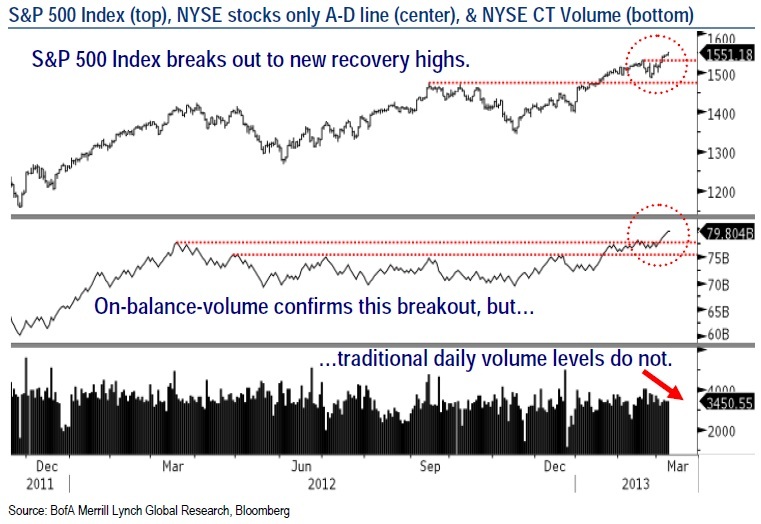 NYSE consolidated tape volume of 3.6bn shares was lackluster on the breakout, but our Volume Intensity Model and on-balance-volume, which measure accumulation or buying are positive and confirmed the new recovery highs. She also observes that sentiment has gotten somewhat frothy as markets have become short term over-bought. These reflect possible pullbacks, but not the end of the cyclical rally. 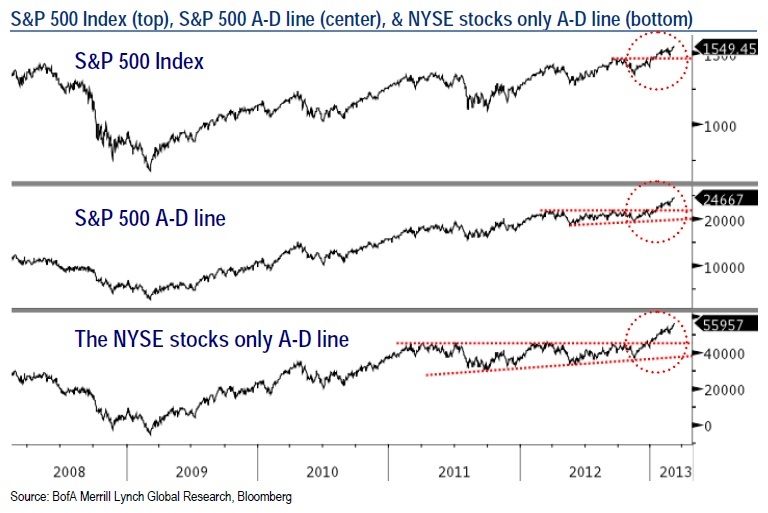 Someone is obviously not complying with the central-planner script and rotating fast enough into equities. In February, total NYSE matched volume (defined as the number of shares of equity securities and exchange-traded products executed on the NYSE Group's exchanges), dropped 13.6% from a year ago, 9.4% from January, and at 20.5 billion shares in the 19 trading days of February, represents a fresh decade low for the exchange (source). Perhaps it is time for central planning to take it up a level and restore some more confidence in equities as an asset class, by having the Chairman release some 30 minutes before the start of trading what the closing price for the DJIA will be every day. Only this way can one truly the Fed's dedication to getting every hotdog vendor back into the ponzi scheme that are global stocks, which unlike the last time the Fed lost control and saw the S&P cut in half in a few months, will never happen again. Cause this time it's different. U.S. companies are making record profits. And more of the money is staying offshore, and lightly taxed. Parked a total of $166 billion offshore last year. Making investments in the U.S. The 60 companies were chosen for the analysis because each of them had held at least $5 billion offshore in 2011. The practice is a result of U.S. tax rules that create incentives for companies to maximize the earnings, and holdings, of foreign subsidiaries. The law generally allows companies to not record or pay taxes on profits earned by overseas subsidiaries if the money isn't brought back to the U.S.
Big American companies are booking more of their sales in faster-growing foreign markets. But companies also are moving more of their earnings overseas by assigning valuable patents and licenses to foreign units. Untaxed foreign earnings are part of a contentious debate over U.S. fiscal policy and tax code. The current system attracts criticism from many points of view. Business groups want the U.S. to tax profit based on where it is generated, as many countries do, rather than globally, as the U.S. does now. Moreover, they point out, tax rates are higher in the U.S. than in many other nations, putting American companies at a disadvantage. Others say that the growing cash hoards often are the result of sophisticated corporate maneuvers to shift profits to low-tax countries. 10 parked more earnings offshore last year than they generated for their bottom lines. They include Abbott Laboratories, whose store of untaxed overseas earnings rose by $8.1 billion, to $40 billion. The increase exceeded the pharmaceutical maker's net income of $6 billion, which was weighed down by a $1.4 billion charge related to early repayment of debt. Including that charge, Abbott reported a pretax loss on its U.S. operations. An Abbott spokesman declined to comment. Honeywell International HON +2.12%Inc. boosted its store of untaxed earnings held by its offshore subsidiaries and earmarked for foreign investment by $3.5 billion last year to $11.6 billion, a rise equal to the industrial conglomerate's annual profit, excluding a pension adjustment. The company said the increase resulted from $2.1 billion of pretax earnings from its foreign subsidiaries and changes in estimates. Chief Financial Officer Dave Anderson says Honeywell needs to invest outside the U.S. to fuel foreign sales, which accounted for 54% of Honeywell's revenue last year. He also says the tax code is part of the equation. "The anachronistic tax system that we have penalizes companies for their success outside of the U.S.,"
The amount of money at stake is significant, particularly when the U.S. budget deficit is high on the political agenda. Just 19 of the 60 companies in the Journal's survey disclose the tax hit they could face if they brought the money back to their U.S. parent. Those companies say they might have to pay $98 billion in additional tax—more than the $85 billion in automatic-spending cuts triggered this month after the White House and Congress couldn't agree on an alternative. The Joint Committee on Taxation estimates that changing the law to fully tax overseas earnings would generate an additional $42 billion for the Treasury this year alone. Congress enacted a temporary tax holiday in 2004, prompting companies to repatriate $312 billion in foreign earnings. The law was intended to stimulate the U.S. economy, but studies found that few jobs were created and most of the money was used to repurchase shares and pay dividends. Another such holiday is considered unlikely in the next few years. The Journal's survey of new regulatory filings found that the total earnings held by the 60 companies' foreign subsidiaries rose 15%, to $1.3 trillion, from $1.13 trillion a year earlier. The trend was most pronounced among the 26 technology and health-care companies in the Journal survey. Collectively, they parked $120 billion in foreign units last year, accounting for nearly three-quarters of the total. At some of these companies, foreign subsidiaries hold almost all the company's cash. Johnson & Johnson JNJ +0.57%says its foreign subsidiaries held $14.8 billion in cash and cash equivalents as of Dec. 30, out of a total of $14.9 billion. Not all of the earnings parked offshore are in cash. Some of the money is used to build plants and buy equipment overseas. In a paper last year, Wharton School accounting professor Jennifer Blouin and two co-authors estimated that 43% of the offshore earnings were held in cash. A Senate committee last year found that many tech and health-care companies have shifted intellectual property—such as patent and marketing rights—to subsidiaries in low-tax countries. The companies then record sales and profits from these lower-tax countries, which reduces their tax payments. "There are opportunities to basically wipe away your tax on your intellectual property," says Ms. Blouin, the Wharton professor. Software maker Microsoft Corp. boosted the holdings of its foreign subsidiaries by $16 billion in the fiscal year ended June 30, 2012, to $60.8 billion, the third-largest holding in the Journal survey. The growth in Microsoft's overseas holdings nearly equaled its net income for the year of $17 billion—in part because Microsoft said its foreign operations accounted for 93% of its pretax profit last year. In its report, the Senate committee said Microsoft had shifted intellectual property to subsidiaries in Singapore, Ireland and Puerto Rico, to avoid roughly $4 billion in U.S. taxes in 2011. Licensing rights, and revenue, sometimes traveled through more than one subsidiary to minimize the tax bill. "Microsoft complies with the tax rules in each jurisdiction in which it operates and pays billions of dollars in U.S. federal, state, local and foreign taxes each year," Bill Sample, Microsoft's corporate vice president for world-wide taxation, told the Senate committee in September. A Microsoft spokesman declined to comment further. Oracle Corp. reported holding $20.9 billion in its foreign subsidiaries as of May 31, 2012, up 30% from a year earlier. Oracle lowered its tax rate last year to 23%, from 25.1% in 2011, raising its bottom line by $272 million. In a securities filing, Oracle said the tax rate fell in part because it "increased the number of foreign subsidiaries" in low-tax countries; the filing listed four Irish subsidiaries that weren't listed the prior year. Oracle said it expects the new subsidiaries to help it maintain a lower tax rate. An Oracle spokeswoman didn't respond to requests for comment. Abbott runs manufacturing plants in more than a dozen foreign countries, plus Puerto Rico, and generated 58% of its $40 billion in 2012 revenue outside the U.S. In a securities filing, Abbott estimated that lower tax rates on its foreign operations cut its U.S. tax bill by $1.6 billion last year. A big Abbott subsidiary in Ireland, Abbott Laboratories Vascular Enterprises Ltd., reported profit of €1.1 billion for 2011 ($1.43 billion), the latest figures available, and paid no Irish tax, because it is incorporated in Bermuda, according to an Irish corporate filing. Some companies are accumulating large sums of earnings that they say will remain outside the U.S. General Electric Co. reported $108 billion held offshore at the end of last year, up from $102 billion a year earlier; GE says most of that is invested in active business operations such as plants and research centers. At Pfizer Inc., PFE -0.28%the total rose to $73 billion, from $63 billion. The swelling totals have sparked friction at companies such as Apple Inc., where investors want executives to distribute more cash through dividends and share repurchases. Overseas balances have grown in part because U.S. multinational companies are paying less tax on their overseas operations. Offshore subsidiaries of U.S. companies paid an average 14% tax rate in 2008, according to the most recent statistics from the Internal Revenue Service, down from 16% in 2004. Corporate filings offer a glimpse of the low rates companies pay outside the U.S.
Apple said it held $40.4 billion in untaxed earnings outside the U.S. as of Sept. 29, 2012. Apple estimated that it would owe $13.8 billion in tax if it brought that money back to the U.S. That is a 34% tax rate, just shy of the federal 35% rate. Since foreign income taxes are creditable on U.S. taxes, that means Apple has paid less than 5% tax on those earnings to date, says Ms. Blouin, the Wharton professor. "Anything I bought at $80 I don't like as well at $100. But if you're asking me if stocks are cheaper than other forms of investment, in my view the answer is yes. We're buying stocks now. But not because we expect them to go up. We're buying them because we think we're getting good value for them." He said stocks are not "as cheap as they were four years ago" but "you get more for your money" compared to other investments. "The dumbest investment, in my view, is a long-term government bond." Buffett revealed that a potential acquisition had been "mentioned" to him and he will be exploring the idea, no deal is imminent. "That's always a low probability. Whether it's a five percent or ten percent, who knows? "We're continuing to see a slow recovery," he said. "It hasn't taken off, but it hasn't stopped either." Buffett said that while the sequester will reduce the government's stimulus of the economy by cutting back on the deficit the remaining spending is still providing the economy a lot of "juice." "It's not galloping at all, but we are making progress bit by bit. Everybody would love to see it faster. But it's not going into reverse and I do not think the sequester will cause it to go into reverse." He said that rates near zero have pushed stocks higher than they would have gone otherwise and the global markets are on a "hair trigger," looking for any sign the central bank may start raising rates. "I think the Fed will try to give little signals here and all of that. But in the end, there are an awful lot of people who want to get out of a lot of assets if they think the Fed is going to tighten a lot." The results of higher rates, he said, "will be very noticeable" in the markets. While stocks will be hurt by higher rates, Buffett said other investments will also be affected and he still thinks equities are the best thing to buy now. "when a person with experience meets a person with money, the person with the money gets the experience and the person with the experience gets the money." Warren Buffett called 2012 "subpar" in his annual letter to shareholders as Berkshire Hathaway's per-share book value rose 14.4 percent, less than the S&P 500's 16-percent increase. It's the ninth time in 48 years this has happened. Buffett notes that the S&P 500 has outpaced Berkshire over the past four years, and if the market continues to gain this year the benchmark stock index could have its first five-year win ever. "When the partnership I ran took control of Berkshire in 1965, I could never have dreamed that a year in which we had a gain of $24.1 billion would be subpar. ... But subpar it was." Buffett notes that while he believes Berkshire's intrinsic value will probably beat the S&P 500 by a "small margin" over time, the company's relative performance is better when the market is down or unchanged. "In years when the market is particularly strong, expect us to fall short." Even so, Buffett warned that he and partner Charlie Munger "will not change yardsticks. "It's our job to increase intrinsic business value — for which we use book value as a significantly understated proxy — at a faster rate than the market gains of the S&P." If they are successful, Berkshire's share price will beat the S&P 500 "over time." Buffett also expressed disappointment that Berkshire didn't make a major acquisition last year. "I pursued a couple of elephants, but came up empty-handed." "we still have plenty of cash and are generating more at a good clip." "So it's back to work; Charlie and I have again donned our safari outfits and resumed our search," Buffett said. "We spent a record $9.8 billion on plants and equipment last year. We will keep our foot to the floor and will almost certainly set still another record for capital expenditures in 2013. Opportunities abound in America." Buffett still sees an opportunity in local newspapers. Berkshire has spent $344 million to buy 28 dailies, and Buffett expected more purchases of "papers of the type we like" at "appropriate prices." Even though he still believes overall newspaper industry profits are "certain" to drop, Buffett likes smaller community-oriented newspapers that provide local news and information that can't be obtained elsewhere. "Wherever there is a pervasive sense of community, a paper that serves the special informational needs of that community will remain indispensable to a significant portion of its residents." Buffett isn't a fan of giving that information away for free on the Internet, pointing out that an Arkansas paper has retained its circulation "far better than any other large paper in the country" after it was an early adopter of a pay model.For its fourth quarter, Berkshire's operating earnings per share came in at $1704, below the consensus estimate of $1755 from the few analysts who follow the firm. The company's net earnings were $4.55 billion in the quarter, up from $3.05 billion in last year's Q4. That includes "paper" gains for derivatives contracts Berkshire has sold that provide insurance against losses for some corporate bonds and stock indexes. The bond-related contracts will expire in the next year. Buffett expects they will generate a $1 billion pre-tax profit. After unwinding about 10 percent of its exposure in 2010 at a profit of $222 million, the remaining stock index contracts will expire between 2018 and 2026. Many fine writers have observed that there exists a de facto Ruling Class in Washington. Once men and women get to Congress, no matter how inept, inane, or diabolical they prove to be, the power of incumbency makes dislodging them akin to prying a Reese's Cup from Michael Moore's pudgy fingers. An exhaustive study -- "Reelection Rates of Incumbents in the U.S. House" (PDF) -- performed in 2006 illustrates the dramatic changes in reelection rates since America's founding. It aggregates the results of every House election cycle between the years 1790 and 2006. Until the Woodrow Wilson era, incumbent reelection rates hovered between 70 and 80 percent. Since then, however, massive wealth redistribution programs at the federal level -- the New Deal, the Square Deal, the Fair Deal, Great Society, etc. -- began cementing incumbents in place. Constituents dependent upon federal largesse became permanently addicted to these programs and the incumbents who fueled them. Had the various branches of government shown fidelity to the Constitution, none of these programs would have come to be. Term limits are one option to resisting incessant federal power grabs, but so too would be leveling the playing field for challengers. Only a return to Constitutional government will solve the Congressional Recidivism problem. Trust in government has plummeted … due to institutional corruption. And see this. More and more Americans realize that the government has bailed out the super-elite of the big banks, and enabled their fraud … while hosing the little guy again and again (and again). People see that we have socialism for the rich, but cut-throat, sink-or-swim capitalism for everyone else. They see that we have a malignant synergism between D.C. politicians and giant companies. Look here, here, here. At the same time, the government spies on virtually all Americans, and has threatened to assassinate or indefinitely detain American citizens on U.S. soil. Folks are starting to wake up to the fact that Obama is a lot like Bush. Indeed, he’s continued many of the horrible Bush programs he promised to stop, covered up for Cheney and company, and allowed even worse inequality and trampling of the Constitution. And that any apparent difference is just a scripted show. For the past seven years, a period covering the final two years of the Bush administration and President Obama’s first term, no more than about three-in-ten Americans have said they trust the federal government to do the right thing always or most of the time. The Pew Research Center in Washington, D.C. has found that fewer Americans than ever trust the decisions made by the government. "mainstream media outlets are basically public relations services for government agencies, large companies, and other influential organizations." Journalists do very little actual journalism — independent investigation, analysis, reporting. there is an official Narrative, explaining the key issues and acceptable opinions on these issues. Journalists’ primary sources are off-the-record, anonymous briefings by government officials or other insiders, who provide the Narrative. A news outlet that deviates from the Narrative by doing its own investigation or offering its own interpretation risks being cut off from the flow of anonymous briefings (and, potentially, excluded from the White House Press Corps and similar groups), which means a loss of prestige and a lower status. Basically, the mainstream news outlets offer their readers a neatly packaged summary of the politically correct positions on various issues. In exchange for sticking to the Narrative, they get access to official sources. Give up one, you lose the other. Readers are beginning to recognize this, and they don’t want to pay. Sequestration reduces the rate of increase in federal spending. It does not cut a penny of actual (nominal) spending. The CBO’s estimate of the reduction in increased spending between 2012 and 2013 is $43 billion, not $85 billion. Total federal spending in 2012 was $3.53 trillion. The President’s budget request for 2013 was $3.59 trillion, an increase of $68 billion (about 2%). Under sequestration, total federal spending in 2013 will be $3.55 trillion, an increase of only $25 billion (a little less than 1%). Did you catch that? Under sequestration, total federal spending goes up, just by less than it would have gone up without sequestration. This is what the Narrative calls a “cut” in spending! It’s as if you asked your boss for a 10% raise, and got only a 5% raise, then told your friends you got a 5% pay cut. Of course, these are nominal figures. In real terms, expenditures could go down, depending on the rate of inflation. Even so, the cuts would be tiny — 1 or 2%. The news media also talk a lot about “debt reduction,” but what they mean is a reduction in the rate at which the debt increases. Even with sequestration, there is a projected budget deficit — the government will spend more than it takes in — during every year until 2023, the last year of the CBO estimates. The Narrative grudgingly admits that sequestration might be necessary to reduce the national debt, but sequestration doesn’t even do that. It’s as if you went on a “dramatic” weight-loss plan by gaining 5 pounds every year instead of 10. This is all public information, easily accessible from the usual places. But mainstream news reporters can’t be bothered to look it up, and don’t feel any need to, because they have the Narrative, which tells them what to say. Seriously, have you read anything in the New York Times, Washington Post, or Wall Street Journal or heard anything on CNN or MSNBC clarifying that the “cuts” are reductions in the rate of increase? Even Wikipedia, much maligned by the establishment media, gets it right: “ sequestration refers to across the board reductions to the planned increases in federal spending that began on March 1, 2013.” If we have Wikipedia, why on earth would we pay for expensive government PR firms? While FX Reserves may not exactly be freely spendable ready cash, they are often used a proxy for a nation that is 'wealthy'. It seems, however, from the following chart that in fact the FX reserves of the world shows a different picture than Americans might like to consider. The highest level of reserves are split between currency manipulators and resource-rich nations. China and Japan top the table, according to Bloomberg, and Saudi Arabia and Russia are rising fast up the league tables of FX horders. Just as notable is that China's FX reserves have swelled to $3.31 trillion at the end of 2012 from $286.4 billion a decade ago, representing a pace of $829 million per day. The problem is that recently China has hardly had the same appetite for the USD it exhibited in prior years. With the world apparently devaluing against a more stoic inflation-anxious China, it would seem Japan's 'horde' will dwindle fast if they ever do anything but jawbone. Still, the high level of foreign exchange reserves of the world’s two biggest holders - China and Japan - has raised questions over their objectives. Reserves in China, which has been accused by the U.S. of keeping its currency weak to promote exports, swelled to $3.31 trillion at the end of 2012 from $286.4 billion a decade ago, representing a pace of $829 million per day. Yet, the yuan strengthened 33 percent against the dollar in that period. Japan’s foreign reserves have ballooned since the global financial crisis because of the yen’s status as a safe haven. China’s reserves stood at 40 percent of its GDP, while Japan’s are at 20 percent.